What Causes Children to Have Hearing Loss? There are several possible causes for children and hearing loss, whether it’s congenital or acquired. Hearing losses in children can also be conductive, sensorineural or mixed. It’s important that parents, caretakers, physicians, teachers and others know the signs of and addresses hearing loss in children because early hearing loss – especially that which is undiagnosed – can cause significant development and emotional problems for children that have long-lasting effects. What does “congenital hearing loss” mean? This means that the hearing loss was present at birth. There are many causes of congenital hearing loss, some are not as easily identified. There are non-genetic and genetic factors that could lead to hearing loss. Birth Complications: this includes the presence of Herpes, Rubella Cytomegalovirus, Toxoplasmosis or any other serious infection. Another complication that can arise is a lack of oxygen to the baby. Premature Birth: a baby that is born smaller than 3 pounds and or that require certain life-sustaining drugs for respiration are at a higher risk for hearing loss than a full-term sized baby. Use of Ototoxic Medication By the Mother During Pregnancy: Ototoxic medications are not usually illicit substances – medications like various antibiotics and NSAIDS can potentially cause damage to the auditory nerve or other hearing structures of the fetus. Infection of the Mother During Pregnancy: infections such as toxoplasmosis, cytomegalovirus, herpes simplex or German measles can lead to children and hearing loss. Non-genetic factors only account for about 25% of all congenital hearing loss. Experts agree that genetic factors – meaning the hearing loss is hereditary – cause more than 50 percent of all hearing loss in children, whether the loss is present at birth or manifests later in life (Mroz). Autosomal-Recessive Hearing Loss – This is the most common type of genetic congenital hearing loss – autosomal recessive accounts for around 70 percent of all genetic hearing loss cases. What this means is that neither parent has a hearing loss, but each parent carries a recessive gene that gets passed to the child. Parents are usually surprised when their child is born with this type of hearing loss because people typically aren’t even aware they have the recessive gene. Autosomal-Dominant Hearing Loss – This type of hearing loss accounts for around 15 percent of genetic hearing losses, according to the American Speech-Language-Hearing Association (ASHA). In autosomal dominant hearing loss, one parent carrying a dominant gene for hearing loss passes it to the offspring. This parent may or may not have hearing loss, but he or she might have other symptoms or signs of a genetic syndrome. Other genetic syndromes include; Usher syndrome, Treacher Collins syndrome, Waardenburg syndrome, Down syndrome, Crouzon syndrome and Alport syndrome. 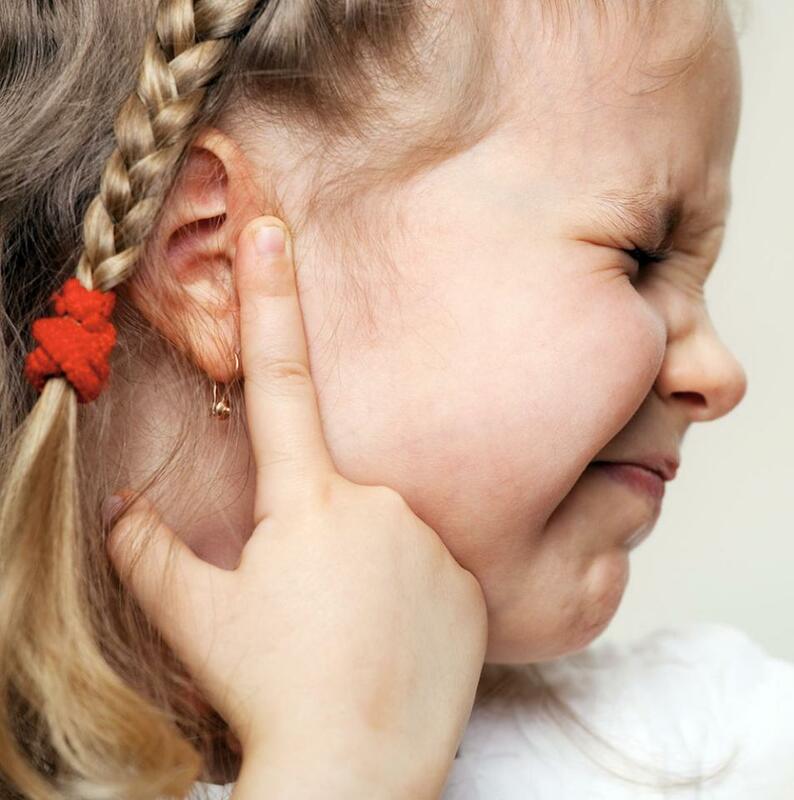 At least 75 percent of children have had one episode of otitis media by the time they are three years old. This type of infection is very common in children because of the Eustachian tube position during childhood. The Eustachian tube, which allows for air pressure equalization between the middle ear and the nasopharynx, is smaller and more horizontal during development. Thus, it is very susceptible to blockage by fluids or large adenoids (Mroz). Transient hearing loss due to an ear infection can occur when fluid inhibits the vibrations of the tiny middle ear bones, making efficient sound transmission difficult. Thankfully, this type of hearing loss is usually temporary and resolves itself. However, frequent, untreated middle ear infections can cause cumulative damage to the bones, eardrum or auditory nerve, creating a permanent, sensorineural hearing loss (Mroz). It is routine for hospitals to perform hearing screenings on infants in the first 24-48 hours after birth. If an infant fails the initial screening, he or she is usually scheduled for a second screening a few weeks later. 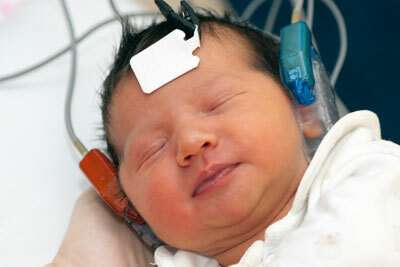 However, sometimes infants who pass the hearing screening at birth may exhibit signs of hearing loss as they age. 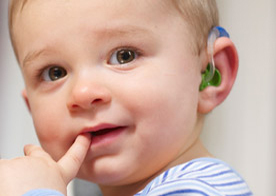 What Kind of Treatment is there for Children and Hearing Loss? Hearing aids are just one kind of device that can help children with hearing loss hear clearly again. There are many advanced models, including high-powered aids for children with profound hearing loss, that offer high-quality hearing assistance. Many solutions for children include special coverings and other accessories to ensure that young children don’t remove or misplace their hearing aids. There are several models of devices to choose from, including behind-the-ear hearing aids or those that are almost entirely in the ear canal and very discreet. Cochlear implants are surgically implanted devices that directly stimulate the auditory nerve in the inner ear with electrical stimulation. Cochlear implants also have an external device, and many companies make kid-friendly devices that can be held on with a soft headband. 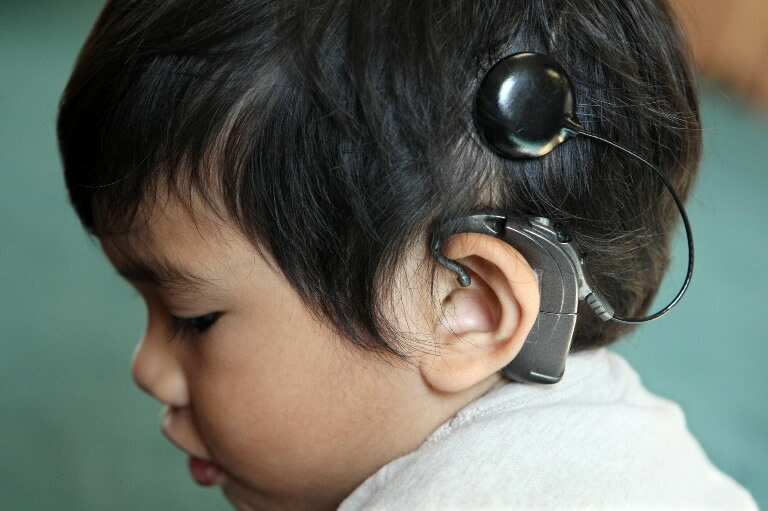 Cochlear implants work for infants and children who cannot benefit from hearing aids. For children who have had hearing loss that has affected their speech, he or she might need speech-language therapy after getting hearing aids or a cochlear implant to help him or her catch up on speech delays. Many hearing aid manufacturing companies offer assistive listening devices such as FM systems that are discreet and work well in a classroom situation in conjunction with the child’s hearing aid or cochlear implant. FM technology helps overcome the poor acoustics of classroom settings or other venues with lots of background noise. Essentially, the teacher wears or has a discreet microphone in front of him or her that transmits his or her voice directly to the child’s hearing aids or cochlear implant. To read more about children and hearing loss, click HERE.